RadTreeView supports showing CheckBox elements and checking specific items from its ItemsSource. The checked items are added to the CheckedItems property of the control. You can also control the Visibility of the CheckBox elements as well as their state propagation. None: The CheckBox would not be present. Individual: The CheckBox state will affect only the individual item. Propagate: The CheckBox state of the children items will affect the parent item. In case all items within a parent nodes are checked - it will be with checked state as well. If all items are not checked, the parent item will not be checked. If only some of the children items are checked, the parent item will be shown with an indeterminate state. 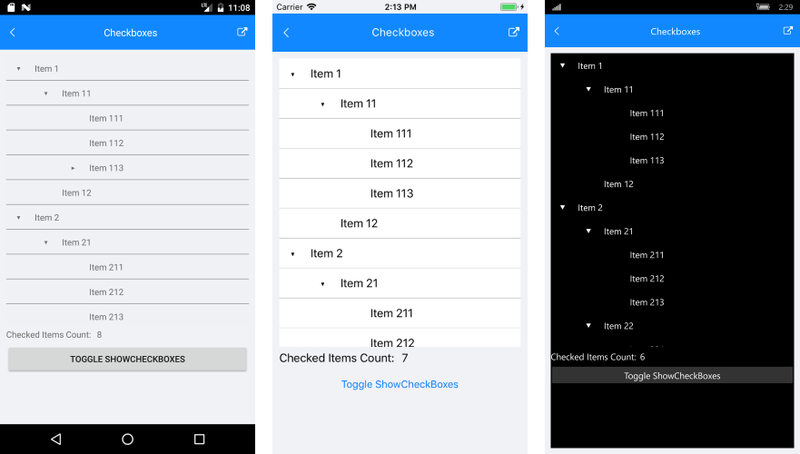 When adding items to the items source of the TreeView, the checked state will propagate according to the parent item. The RadTreeView exposes two methods to programmatically check or uncheck an item.